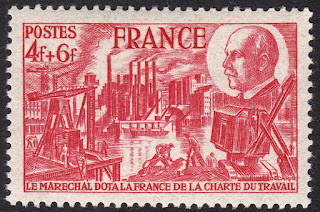 In 1944, Albert Decaris designed and engraved a stamp for France, the topic of which, from what I've read and tried to deduce, seems rather controversial. Let's take a look at the stamp. It has a face value of 4f with a 6f surcharge. The stamp, although rather austere in nature, is loaded with great detail. The cogs of industry grinding away in the background, made alive by smoke billowing from the stacks. The workers in the foreground personifying the Work aspect of the nationalist slogan. 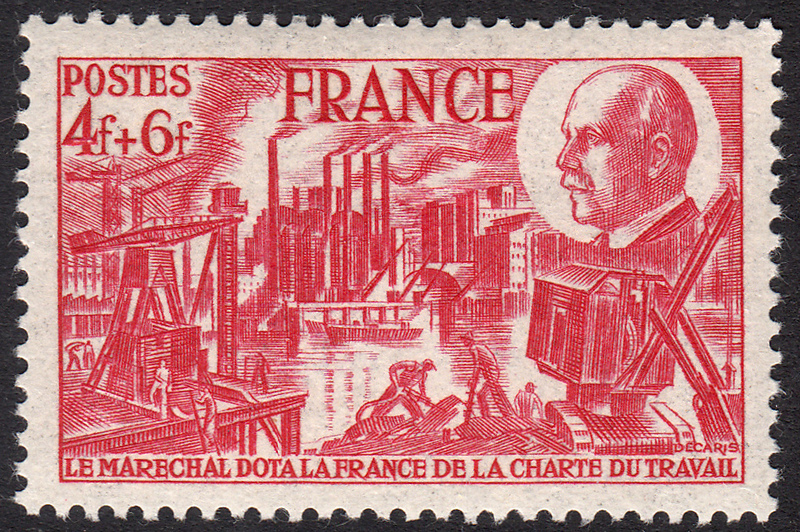 And in the top right corner we have a fine rendering of the man himself, Philippe Petain.